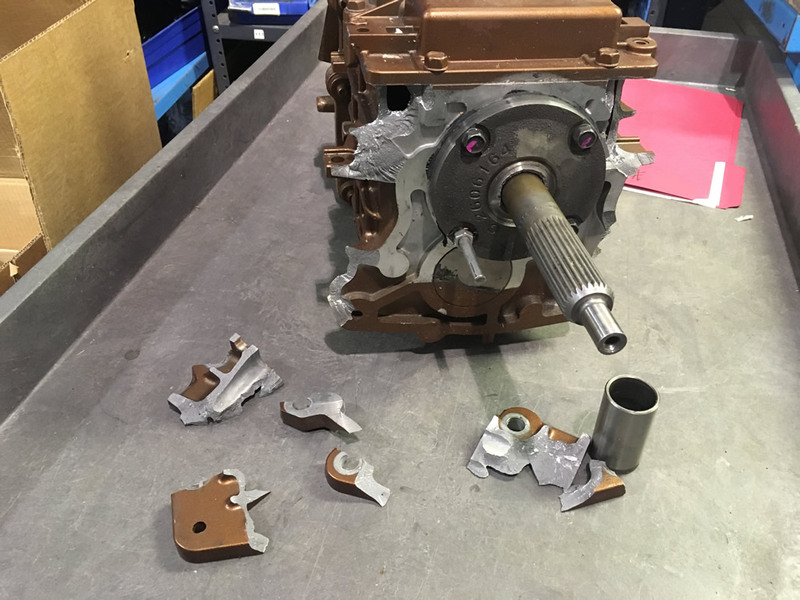 Articles - TREMEC TKO Disaster! Mating the transmission and bellhousing can sometimes be a difficult task because you don't have much wiggle room and transmissions are heavy. There are a few tricks, you can put in the slip yoke and twist it back and forth to get the input shaft lined up correctly. You can gently jiggle the transmission to get it past whatever is hanging it up, but you can not, and it's in ALL CAPS, BOLD AND UNDERLINED in the installation manual, use the bellhousing bolts to draw the transmission to the bellhousing. As our installation manual says, this will result in broken ears and will void the warranty. Recently, one of our customers learned the hard way that this warning is printed in every manual for a reason. While he managed to draw the transmission to the bellhousing using the bolts without breaking the ears, this put the transmission into a bind. Later, when he drove the car, the rotation of the engine increased the pressue of the bind to the point that something had to give and the aluminum transmission case lost its ears. Let his misfortune be your warning, never draw in a transmission with the bellhousing bolts!